Shopping for a new Jeep Compass? The 2019 Jeep Compass gets better with active safety equipment. We suggest starting with a Latitude and advanced safety gear, then go wild with personalization—Jeep does that best. The 2019 Jeep Compass splits hairs to find its narrow niche among compact crossover SUVs. Bigger than a Renegade but smaller than a Cherokee, the Compass steers toward comfort and usability than scrambling up a mountainside. The Jeep Compass borrows much of its looks from the Cherokee and Grand Cherokee, which have softer lines than the Renegade or Wrangler. Up front, the Compass wears its seven-slot grille and headlights well. Along the sides and in back, the Compass is more modern—especially with a two-tone roof. Under the hood, a 2.4-liter inline-4 mates most often to a 9-speed automatic transmission—or a 6-speed if equipped with only front-wheel drive. The inline-4 makes 180 horsepower, which is enough to adequately power the Compass around town, but a finicky 9-speed keeps it from living at its best. Trailhawk models offer off-road must-haves such as a simulated low-speed first gear for crawling and a “Rock” setting for the terrain selection system in the Compass. 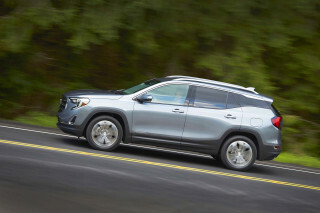 Official rating agencies are split on the Compass’ crashworthiness, and Jeep doesn’t offer active safety features on base versions—it’s a spend-up option on the top three trim levels. 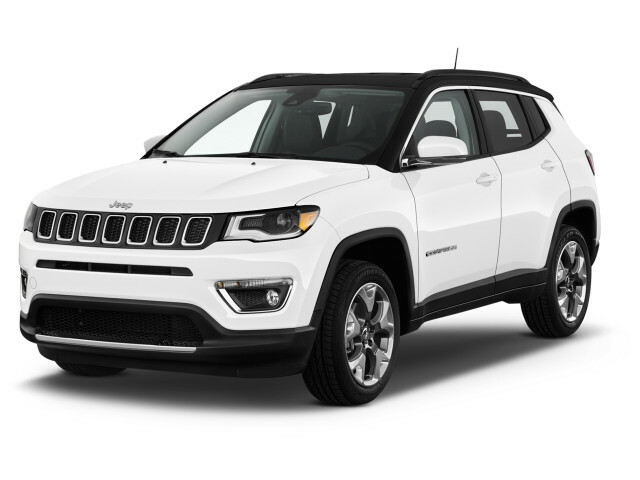 Every Jeep Compass is well-equipped with a 7.0-inch touchscreen for infotainment with Apple CarPlay and Android Auto compatibility, Bluetooth connectivity, two USB ports, cloth upholstery, and at least 16-inch wheels. Popular upgrades include heated seats and steering wheel, leather upholstery, an 8.4-inch touchscreen with navigation, and appearance trim packages such as this year’s High Altitude and Upland editions. The Compass wears some of Jeep’s better lines. Think of it like a budget Grand Cherokee; that’s not a bad thing, either. The 2019 Jeep Compass is sized closer to the smaller Renegade, but borrows heavily from the bigger Cherokee and Grand Cherokee. Its influence from the Grand Cherokee is immediate from the front. The Compass wears the same seven-slot grille borrowed from the bigger SUV, chrome and all in some cases. The Cherokee now has a derivative of both, but we’re partial to the look on the Compass if we’re pressed. Around the sides and the back, the Compass looks like a modern Jeep—even though we still pine for an ‘80s-era Cherokee. 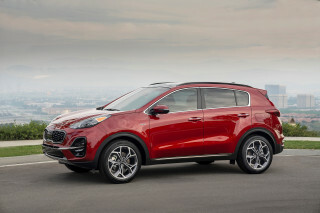 The base Sport trim doesn’t look the part of a Jeep without optional roof rails and alloy wheels. Trailhawks get their own butch look, complete with different front and rear bumpers for better clearance, red tow hooks, and chunky tires. Inside, the Compass wears more organic shapes and toned-down lines. Jeep gathered climate controls and other functions below the 7.0-inch infotainment screen, while a chunky knob for traction control programs takes up real estate below the center stack. The 2019 Jeep Compass is quietly comfortable and civilized, better suited for around-town than bouldering. Like many compact crossovers, the 2019 Jeep Compass steers and rides well but its power isn’t overwhelming. Every Jeep Compass is fitted with a 2.4-liter inline-4 that makes 180 horsepower and 175 pound-feet of torque. The base transmission is a 6-speed manual that’s harder to find than Bigfoot. It’s standard on Sport and Latitude models with all-wheel drive. A 6-speed automatic is standard on front-drive Latitude and Limited models, and a 9-speed automatic is available with all-wheel drive in Sport and Latitude trims, and it’s standard on Trailhawk and Limited models. The 2.4-liter inline-4 is shared throughout several Fiat Chrysler Automobiles vehicles, including the Jeep Renegade and Cherokee. In the Compass, the inline-4 adequately powers the crossover around town, but an indecisive 9-speed saps whatever might it can muster. The Compass skips some of the low-speed indecision we’ve found in other FCA vehicles, but the busy transmission struggles to kickdown for highway passes or deeper stabs at the accelerator. The Compass gets an independent suspension on all models that soaks up road imperfections. The tough-talking Trailhawk trim gets an off-road setup, but it’s clear that the Compass was tuned for on-road comfort more than perhaps off-road prowess. The base Compass gets 16-inch wheels that we haven’t sampled, but the ride isn’t spoiled by 17-inchers that are standard on Latitude and Trailhawk trims. Tap into the Limited’s 18-inchers, or optional 19-inchers, and the ride starts to get jittery. For an off-road-ready clientele, Jeep offers a Compass Trailhawk crossover SUV. It sports a more than a few trail-ready add-ons. Jeep lifts the Trailhawk’s suspension about an inch for 8.4 inches of ground clearance, and the 9-speed automatic’s first gear simulates a low range for a 20:1 crawl ratio. Jeep adds a “Rock Mode” into the traction control system, which includes hill-descent control and helps control the Jeep on tricky declines. The 2019 Jeep Compass is pleasantly uptown in materials and execution, with room for four adults. There’s reasonable space inside the 2019 Jeep Compass, especially considering its tight dimensions. The front seats feel narrow and thinly padded, according to our rumps. Every Jeep Compass is fitted with a height-adjustable driver’s seat, but power adjustment and a height-adjustable passenger’s seat requires extra cash. The rear seats should be fine for two adults—three if they’re coworkers that you don’t particularly like. Leg room in the back is above average with 38.3 inches, and there’s plenty of head room for taller riders—even with an optional sunroof. With the rear seats up, the Compass offers 27.2 cubic feet of cargo room, which is in line with the class, but its cargo floor is more than 31 inches off the ground, which is taller than most. The interior materials on the Compass are mostly soft and high-buck, with base versions wearing a durable cloth upholstery. Latitude trims get a blend of synthetic material and cloth that feels wash and ready, and Trailhawk versions get their own leather and cloth buckets that can be upgraded to leather. Top-shelf Limiteds get all leather that feels thin but also nice. Official crash-test scores on the 2019 Jeep Compass are mixed. Official safety rating agencies are mixed on the 2019 Jeep Compass. 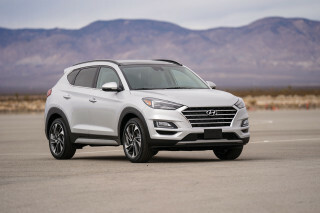 The IIHS gave the small crossover SUV top “Good” scores on its entire crash battery, including a “Superior” score for its optional front-crash prevention. “Poor” and “Marginal” scores for its headlights prevented it from earning a Top Safety Pick award. Jeep offers spend-up active safety features such as forward-collision warnings with automatic emergency braking, blind-spot monitors, adaptive cruise control, active lane control, and rear parking sensors on all trim levels except the base version. That lags competitors such as Toyota and Nissan, which make the technology standard on all trims. Aside from active safety features, the Jeep Compass is equipped with seven airbags, standard traction control systems, and a rearview camera. Outward vision in the Compass isn’t great, and we suggest opting for blind-spot monitors to cut down the Jeep’s sizable blind spots. All 2019 Jeep Compasses offer a generously sized infotainment screen but some lack optional safety equipment that’s quickly becoming standard. Base versions of the 2019 Jeep Compass offer decent equipment, but lag rivals that make automatic emergency braking standard on every model. The Compass is offered in Sport, Latitude, Trailhawk, and Limited trims, with increasing creature comforts at every stop. Automatic emergency braking is only available on the latter three trims, where it’s a spend-up extra. The base Sport models are equipped with 16-inch wheels, keyless ignition, cloth upholstery, air conditioning, Bluetooth connectivity, two USB chargers (one in the front, one in the rear), and a 7.0-inch touchscreen for infotainment with Apple CarPlay and Android Auto compatibility for about $23,000 to start with front-wheel drive. All-wheel drive costs about $1,500. Sport versions can be dressed up with appearance packages; better interior tech, including a 7.0-inch digital instrument cluster; heated front seats and a heated steering wheel; or alloy wheels; but, base versions skip active safety features. So we start instead with Latitude trims that offer active safety features and add as standard automatic headlights, 17-inch wheels, a leather-wrapped steering wheel, upgraded cloth upholstery, and more available options for about $26,000. A bevy of spend-up extras is available on Latitude trims including heated seats, active safety, power-adjustable driver’s seat, an 8.4-inch touchscreen for infotainment, and a tow-prep package. 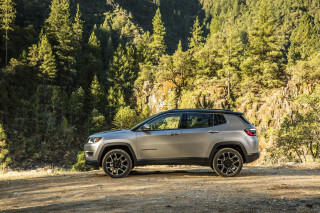 Trailhawk models are only available with four-wheel drive and add some off-roading features that may appeal to buyers looking to take the Compass to a nearby trail. The 2019 Compass Limited starts at more than $30,000 and adds 18-inch wheels, a 7.0-inch digital instrument cluster, leather upholstery, an 8.4-inch touchscreen, remote start, and heated front seats. In our experience, Jeep’s infotainment system is straightforward and simple. We like the common-sense menu layout and its baked-in smartphone compatibility. The 2019 Jeep Compass manages around 25 mpg combined. The 2019 Jeep Compass is reasonably fuel efficient for a compact SUV, regardless of configuration. The most efficient Jeep Compass has front-wheel drive and is equipped with a 6-speed manual. The EPA rates those versions at 23 mpg city, 32 highway, 26 combined. 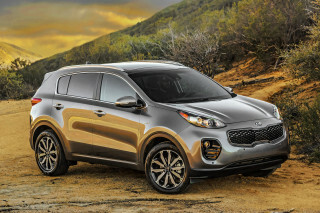 Opting for an automatic, which many buyers will do, drops those ratings to 22/31/25 mpg. 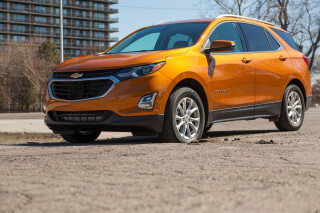 Opting for four-wheel drive shaves 1 mpg from the highway rating. Rivals from Honda and Toyota post better fuel economy ratings than the Compass thanks to continuously variable automatics or optional hybrid powertrains. 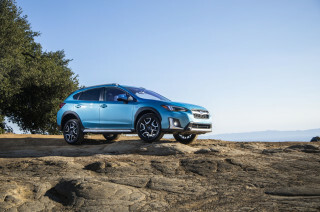 The EPA rates all Honda CR-Vs at 27 mpg combined or better, and the Toyota RAV4 Hybrid does better. Looking for a different year of the Jeep Compass?